Look, flight sales happen all the time (like right now). And surprising someone with a plane ticket somewhere is nice. But there's nothing romantic about flying these days unless you're on a magic carpet. 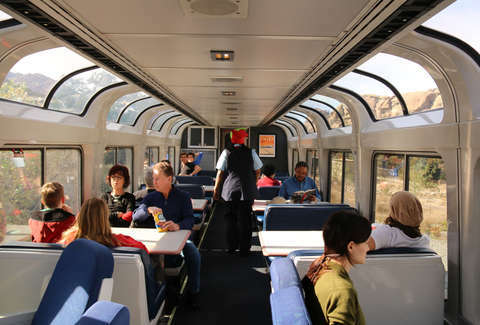 Trains, on the other hand, are extremely romantic and come complete with a dining car. So for Valentine's Day, instead of buying that plane ticket, maybe check out this two-for-one deal from Amtrak, and get two tickets aboard the... love express? The deal is simple. If you book a ticket between February 14 and February 18, you can get another ticket for nationwide travel between March 25 and July 29 for free, according to Amtrak. And there are no blackout dates. And you'll get free Wi-Fi, two personal items, and two carry-on bags. Keep in mind, however, that these fares only apply to coach seating, and you can't combine the low price with another discount. The offer is only valid for reserved service, so that rules out the Pennsylvanian, Keystone Service, Capitol Corridor, Hiawatha Service, Pacific Surfliner, San Joaquins, and 7000-8999 Thruways. But adults can be accompanied by a child age 2-12 at half the adult fare, with one child per adult, so you can potentially make it a family trip. Here's the official deal page. So, go ahead and climb aboard the love express... ?